Emmanuel was a sculptor known for his cubist style, whose work is in major collections, including The Smithsonian Institution. He lived in Rome for 20 years before moving to Westport. Much of his work reflected his hatred of the Nazis. He received Westport Lifetime Achievement Award in Visual Arts in 1997. 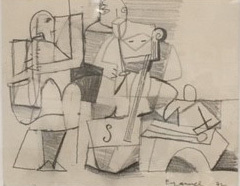 Emmanuel, Herzl, “Abstract Musician,” Westport Public Schools Digital Collections, accessed April 23, 2019, https://collections.westportps.org/items/show/542.